Los comentarios de la aspirante candidata presidencial son un disfraz político. Sus comentarios son solo eso—palabras bonitas, pero en la práctica no vemos nada alentador. Hillary es parte del gabinete presidencial de Obama. Su gobierno de Hillary ha deportado a más de 2 millones de personas. Ella es parte del sistema que detiene y deporta a nuestra comunidad LGBTQJ. Hillary siendo funcionaria gubernamental es autora y cómplice del atropello a los derechos humanos de la comunidad LGBTQJ migrante. •	¿Qué ha hecho ella sobre los años en que se ha le ha pedido al gobierno mejor tratamiento a las personas transgenero en detención? Las condiciones van de mal en peor. ¿Qué está haciendo Hillary sobre los ejemplos de nuestras experiencias con la falta de respeto a la identidad de género, y como hemos sido agredid@s con asalto sexual, abuso psicológico y emocional, negligencia médica e servicios inadecuados de salud mental? •	¿Por qué ahora si nombra nuestra comunidad LGBTQJ como un grupo vulnerable, pero su administración no lo hiso cuando realmente importo—durante la orden ejecutiva migratoria de Obama del 20 de Noviembre? •	También, ella critica al sistema de centros de detención privatizados, pero ¿qué ha hecho para terminar con la industria carcelaria y esos contratos que su mismo gobierno firma con empresas como CCA y Geo Group? •	¿Cuánta abogacía ha hecho para que el Congreso ponga un fin al sistema de cuotas de detención? The comments of the aspiring presidential candidate are a political disguise and farce. Her comments are only that—pretty-sounding words, but in practice we don’t see anything promising. Hillary is part of the cabinet of the Obama administration. Her government has deported more than 2 million people. She is part of the system that detains and deports our LGBTQJ community. As a government official, she is a sponsor and accomplice of the violation of the human rights of the LGBTQJ migrant community. •	What has she done over the years when the government was asked to provide better treatment for transgender people in detention? The conditions seem to only be getting worse. What is Hillary doing about our experiences with being mis-gendered and made targets of sexual assault, psychological and emotional abuse, medical negligence and inadequate mental health services? •	Why does she now consider our LGBTQJ community a vulnerable group, but her administration didn’t think so when it really mattered—during Obama’s November 20th immigration executive order? •	Also, she criticizes the system of for-profit detention centers, but what has she done to end the prison industry and to end those contracts that her own government signs with companies like CCA and Geo Group? •	How much advocacy has she done so that Congress put an end to the quota system of detention? Luis Alberto has been released from detention in Florence! One more free butterfly! ¡ Luis Alberto ha salido de la detención en Florence! Una mariposa mas libre! Author Mariposas Sin FronterasPosted on February 4, 2015 December 3, 2015 Categories Mariposas LibresLeave a comment on ¡Luis Alberto Libre! 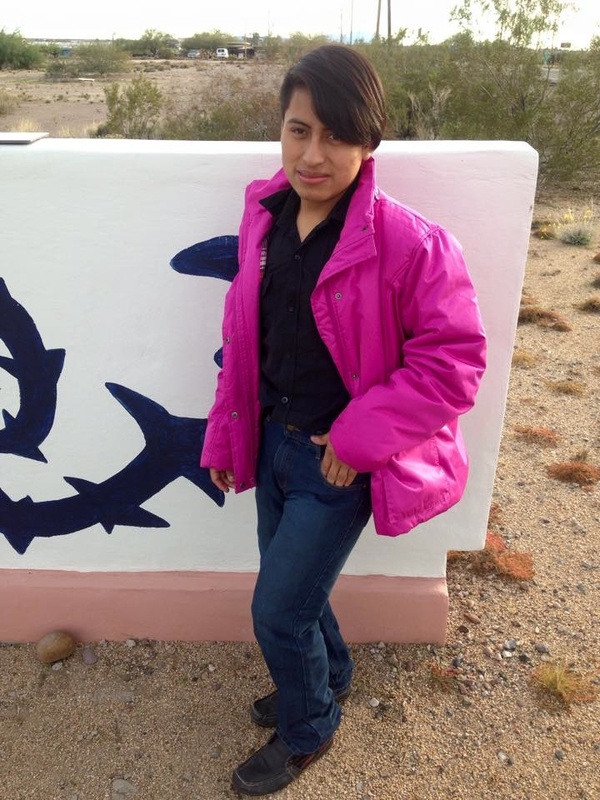 The Transgender Law Center Tuesday called for the release of Nicoll Hernández-Polanco, a Guatemalan trans woman currently being held by Immigration and Customs Enforcement at an all-male detention facility in Florence, Ariz. 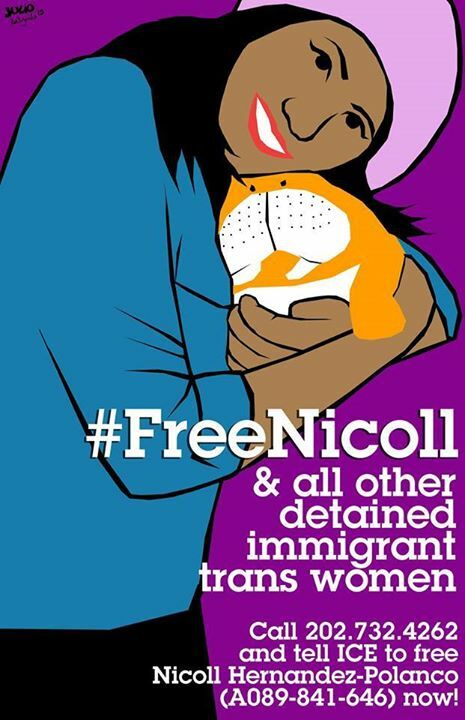 In a “Free Nicoll” petition written with other LGBT and immigrant rights organizations, the Law Center explains that Hernández-Polanco came to the U.S. in October seeking asylum because of constant violent attacks, harassment, sexual abuse, and discrimination in her home country and in Mexico. 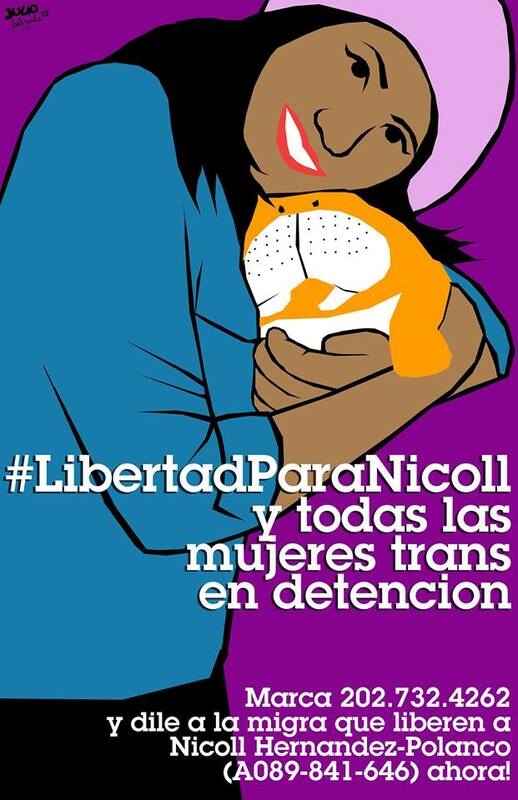 Nicoll Hernández-Polanco (A089-841-646) is a Guatemalan transgender woman currently being detained by Immigration & Customs Enforcement (ICE) in an all-male facility in Florence, AZ. Nicoll presented herself to border patrol agents at the United States border in October 2014 and immediately requested asylum after suffering nearly a decade of sexual and physical violence in Guatemala and Mexico because of her gender identity. Instead of finding safety, Nicoll has experienced continual sexual harassment and abuse at the hands of ICE staff and other detained immigrants for being a transgender woman. Estrellita is free in Tucson! ¡Estrellita esta libre en Tucson! ¡Gracias! I am writing to you with much love and respect to thank you with all my heart the people who have helped me to pay my bond. I am eternally grateful. Blessings to you and may God grant you many blessings, guide, and multiply your kindness and generosity to help those in need. With your help, I am now starting a new life with my family Mariposas Sin Fronteras, where I can improve myself as a person in this country. I have several goals I hope to develop with my effort and dedication and work. One is to fight to win asylum and obtain legal permission. The second is to study English, work and fulfill my duties and obligations to be useful and not waste this opportunity I have been given. Me dirijo a ustedes con mucho cariño y respeto para agradecerles con todo mi corazón las personas que han ayudado con el pago de mi fianza, estoy eternamente agradecido, bendiciones para ustedes y que Dios derrame muchas bendiciones, guie, multiplique su bondad y generosidad de ayudar a quienes lo necesitan, con su ayuda ahora inicie una nueva vida con mi familia Mariposas Sin Fronteras, ahora podre superarme como persona en este pais. Tengo varias metas espero poder desarrollarlas, con mi esfuerzo y dedicacion y trabajo. Uno es luchar para ganar asilo y obtener el permiso legal. Segundo es estudiar inglés, rabajar y cumplir con mis derechos y obligaciones para ser util y no defraudar esta oportunidad que se ma ha dado. Author Mariposas Sin FronterasPosted on February 1, 2015 June 9, 2017 Categories Mariposas Libres, TestimoniesTags EstrellitaLeave a comment on Estrellita is free in Tucson! ¡Estrellita esta libre en Tucson! ¡Gracias! Help Free Estrellita From Detention! Hi, my name is Estrellita! 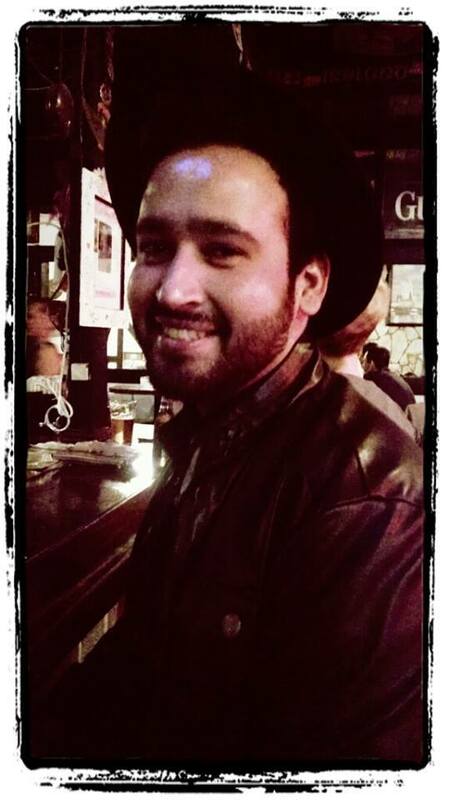 I am 24 years-old and I come fleeing from Guatemala. The reason why is because gang members in my neighborhood tried forcing me to deliver drugs for them. I refused. Within a few days, I found out that they killed a transgender friend of mine for refusing as well. So I decided to leave my country so that I wouldn’t end up the same way. Now I’m in the Florence Detention Center (FDC) and I need your help to get out and meet my goals and dreams to continue studying here in the US. Please help me so that I am not detained for the holidays! Author Mariposas Sin FronterasPosted on December 7, 2014 December 3, 2015 Categories Past CampaignsTags EstrellitaLeave a comment on Help Free Estrellita From Detention!